I am humbled to be here, honored to take this stand before you all. May peace be with you, the prosecution and defense, and to all the supporters, court clerks, and marshals. I am here because of my commitment to justice. I want to begin by touching upon the paradox which my plea in this courtroom implies. As far as the law is concerned, I admit that I willfully entered upon the army instillation at Ft. Benning. I was aware that by crossing that invisible line in the grass I would be subject to arrest and possibly face six months incarceration. I was aware that this petty offense is not petty at all. Neither does the government take this act of defiance lightly, nor do I. It stands for something much greater than you or me. Nevertheless, when it comes time for sentencing, it seems that our violation of the law is the primary issue for you. And so I stipulate to these facts, eager to move beyond this point of law, into what are the primary issues for me. I ask that you please listen to me, and let me explain why I crossed the line and yet believe that I am not-guilty of a moral offense. Perhaps you believe that your role as magistrate is merely to judge whether or not I am guilty of a legal violation, and not to discern whether my action was moral or immoral. Is it beside the point? I believe that there is an important distinction between these two meanings of guilt, which ought to be relevant to the severity of my penalty. By pleading not-guilty, I testify that my conscience guided my actions, that I discerned and deliberated the will of God for me that day. 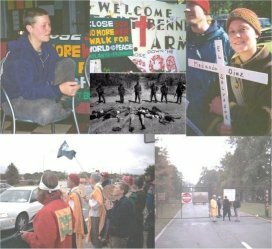 And although it's possible I made the wrong choice, my decision to silently and prayerfully walk onto the property of Ft. Benning was motivated by my commitment to speak out against injustice, to uphold the truth I believe in, and to labor for a more peaceful world. This was an important step in my walk of solidarity with those in Latin America who've faced the violence of death and deception, oppression, torture, fear, and terror at the hands of their armies and graduates of the SOA/WHISC. And I stand here for all victims of war. You've listened to many defendants testify to the nature and extent of this violence. I think you know, deep in your heart, the horror that I'm referring to. We all grieve a person, a community, or an entire people destroyed by war and its root causes. This action of mine is part of my calling to challenge this order of violence and to hold my government accountable for its role in this ongoing tragedy. This is what our rally in November is all about; and I'm grateful that you've supported our right to demonstrate in the streets of Columbus to speak out against this injustice. I need to tell you why this element of civil disobedience is also important, why it is not an act of desperation or chaos, nor poses a threat to society. Non-violent civil disobedience brings attention to the nature of injustice the way no ordinary action can. It awakens people on a personal level, stirs them out of their complacency, and can motivate them to higher levels of compassion. While bringing focused attention to the issue at hand, it challenges people and compels them to reflection and action. If anything, it makes people think. I think it's very sad that the facts themselves, the circumstances of war and oppression and racism do not compel most people to respond with empathy and dedication to working for change. Many people want to live in a just society, but aren't willing to make the sacrifices needed to overcome this evil among us. It's analogous to repenting with words but not with deeds. We've been taught to accept this shameful state of affairs as inevitable, as beyond our capacity to change. We are a society plagued with apathy and complicity, and it's hard to convert our lifestyles. For those who thirst for justice, this climate of increasing injustice can lead us to frustration and despair, or to a deepening of our personal commitment, sacrificing our pleasures and privileges to help our neighbors wake up. We cross not only for ourselves, but for those around us. We cross with a belief that nothing is inevitable. We who crossed the line were fueled with hope that our efforts and actions and prayers will awaken people to this serious issue and help shut down the new School of Americas. By crossing the line we cry out on behalf of our Latin neighbors, and we cry not only to our government but to the hearts of the American public. Our job is to speak truth to power, with the power of compassion to convert people's hearts. Our steps testify to this hope that humanity can change, that our goodness can overcome evil. In the funeral procession that commemorates the victims of countless massacres and assassinations, we cross onto what we consider to be sacred ground. And for disobeying this law, in order to bring attention to our cause, you've convicted and incarcerated over a hundred women and men. Many of them are wonderful citizens, people cherished by their communities all across the United States. When these people are hauled off in shackles to suffer the dehumanizing conditions of our jails and prisons—all for their peaceful and well-intentioned violations—-it shocks people deeply, like a ripple across the water. That you would sentence elderly nuns to prison camps, where they endure some of the most appalling living conditions in the US--it enrages people. And in that first moment of shock, when that sickening feeling stirs in their guts, their disgust and disenchantment with our system rises, leaving a taste of that bitter irony born of injustice. It's a very human reaction. In that precious moment, people across the country become alerted to (he primary issue, the motivation that drives us into this courtroom, which is the SOA. This is the first fruit of our actions. While these trespassers endure their penalties, their suffering is redeemed by the good effected in others and in ourselves. I would not be here today, I might not even know about the SOA, if it weren't for the actions of former prisoners of conscience, two from my hometown of Spokane, Washington. Our crossing would be merely symbolic without your harsh sentences. Do you realize that? Our dissent is symbolized by that petty act of defiance, but it's the irony and injustice and absurdity of these prison sentences that awakens people to the brutality, suffering, and oppression that we are challenging. And yet we know that our penalties are nothing compared to what Latin Americans suffer over and over again by the same abuse of power. So as it is, I believe this ritual crossing has become not only symbolic but sacramental—that is, not only a sign but also an instrument of grace. The anger and sadness provoked in others is transformed into a will to pursue justice, and our own determination is strengthened and purified. This is the beauty of it: the willingness of people to sacrifice their liberty and comfort empowers and inspires others to make their own sacrifices—-perhaps just small changes in their lives, new levels of commitment, or greater contributions to this task of repairing the world. If our actions only lead others to disenchantment and cynicism, we'd be fueling more violence and chaos. I would be ashamed of my participation in it. But what I witness is the grace of God working through us to convert anger into compassion and apathy into hope and dedication. I honestly believe that God is working through us all to bring about fundamental change in this world. My hope is that we are serving as leaven in the dough of humanity. As you mentioned before, this movement has grown every year, and pressure has been mounting in Congress by people's phone calls, letters, and lobbying. This element of non-violent civil disobedience is only one part of a greater movement, and I doubt that we've exhausted its power. So we willingly put our lives in jeopardy for this cause. Perhaps we behave like what St. Paul calls "fools for Christ," following a wisdom which is folly to this world. This trial, absurd and surreal as it may feel, is essential. Your response, Judge Faircloth, is instrumental. Please don’t interpret this as disrespect. I believe that you are a faithful man, devoted to justice as you see it, and believe in upholding the laws of this country. I do respect that. I also believe that you pray daily, as I do, "Our Father in heaven, thy kingdom come, thy will be done, on earth as it is in heaven". And as I see it, it's all about discerning God's Will in our lives and following it. I pray that you discern God's Will before sentencing us, and as a judge, that you don't feel like a disempowered pawn in this political system. It may sound strange, but I think it's possible that God has willed these harsh sentences. Not because we personally deserve this punishment, but in order to transform and redeem this suffering. I have seen that God prepares our hearts and fills our minds with peace, and through His grace allows our experiences to testify to our hope and faith and commitment. You are a witness that our hope is not squashed; our resolve is not diminished. In other words, your penalties do not deter us, although they do deter some people from crossing. And upon finding me guilty, if you decide to sentence me to ninety days incarceration for having crossed that line, I will tonight be stripped of all my possessions, will stand naked and vulnerable before the guards, and will rest my body in a cell just a few blocks away from here. I may or may not be transferred out. I'm a little nervous, to be honest. I've heard many horrible stories and facts about the dehumanizing and deplorable conditions of the county jails in Georgia. So I will pray for strength and compassion, for peace in my heart, and hope to emerge transformed. I invite you to pray for us too, to remember us as you rest in your comfortable bed at night. Will you wonder about whether we deserve the severity of your sentences, or whether our system really works for true justice? Maybe you'11 be relieved, as I am, that suffering can transform the souls of those who believe in grace. It's the refining fire that tests our faith. Your honor, I will gladly accept what you decide. I rest my case.